This information is for lunging a horse that’s been backed. This is how I lunge my gelding. He’s an experienced animal but can sometimes be very very naughty. I tend to lunge him once a week. This allows me to have a bit of a break from riding him but also allows me to look at how he’s moving, it’s also good exercise when you’re pushed for time. Unless I plan to lunge him over poles (which isn’t very often). I use a standard set of kit when working with him in this way. By now he knows the routine. I put the roller and the bridle on him. I’m fortunate to have a few bridles for this horse so this one I use solely for lunging, it has the same snaffle that I use for dressage and no reins attached, so I’m basically ready to go. I attach the line to the bit on the bridle by threading it through each ring – the side I do this from depends on which rein I’m working on, I change it accordingly. I then walk with the horse into the school. Firstly I warm him up. He starts off in walk, then after a time trot, then canter. I always have the lunge whip with me as it helps chivvy him on, but also should a horse decide to charge at you (and this has never happened to me) it does offer you a bit of protection. Nowadays I always lunge in my hat. My current horse is prone to bucking so better safe than sorry. Most of the time we work on a 18-20 metre circle. I hold the lunge line as I would my reins. Unless I forget I also wear my gloves as it means I have a more secure contact with the lunge line and if he does pull I won’t get grazes on my hands. If he’s working on the left rein the lunge is securely held in my left hand, the slack taken up with my right hand – the whip held in the right as well. If he’s working on the right rein I swap the hands over. After 5 or so minutes when he’s moving freely I the attach the bungee. I use a bungee on this particular horse as he’s prone to locking his neck. As a bungee is elasticated it’s harder for him to set himself against it. The bungee is placed behind his ears, threaded through the bit and then attached to the various rings on the roller. Depending on which muscles I wish to work, depends where I attach it. I also vary the tightness of the bungee depending on how hard I wish to push him and what I’m trying to achieve. I then tend to lunge for 10-12 minutes with the bungee on the horse, we go through various transitions during this process. This horse reacts to my voice commands well, but sometimes needs chivvying along a bit with the whip flicking on the ground to get moving forward. Then detach the bungee and let the horse warm down. 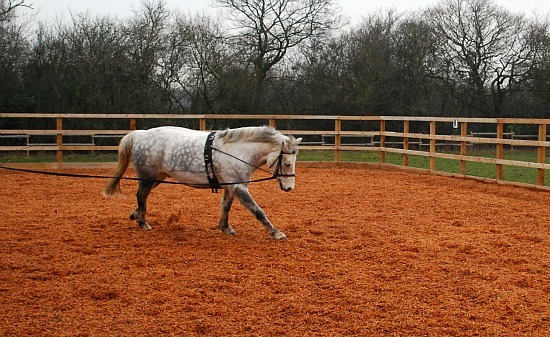 I tend to never lunge a horse that knows what it’s doing more than 20 minutes – experts recommend that more than that places additional stress on the joints as it’s working on a tight circle for a prolonged period of time. My top tip would be stand your ground. This horse is particularly cheeky, most of the time he will lunge brilliantly – ever so occasionally he will try to drag me from one end of the school to the other and will go round at speed bucking. Body language is also key. If you’re backing away from the horse with slumped shoulders looking scared, my horse at least will take the mickey out of you. Stand tall and proud – own your space. If they ever figure out they’re a lot bigger than you you’re doomed! He is a beautiful gelding. – sometimes I have to keep stepping to the left or right to make sure this happens whilst the horse is circling me. If he looks like he’s about to come straight towards you try and flick the whip quickly before he turns encouraging him to continue forward. Side reins can also help. That said my horse for some reason decides on the left rein to stop sometimes and either come straight towards me or rear – he just thinks it’s funny! Hello my TB is quite spooky on the lunge, she tends to look at everything and then when she finds something scary she charges around and around really fast. Due to this I’m a bit put off of lunging her, but I want to teach her to do it properly as its the only piece of her re training we have not got to grips with yet. I know how you feel. My gelding can be an absolute idiot on the lunge at times! At his worst he can drag me from one side of the school to the other. As in the blog post my advice first of all would be make sure you have gloves and a hat on – that way at least when the horse pulls you will have a good grip. 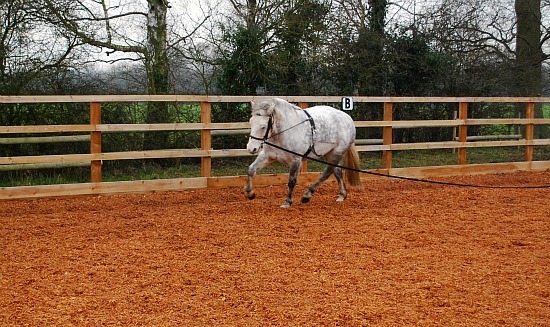 Also try side reins on tight – the idea is you warm them up without them and then attach, but if the horse is being stupid by putting them on tight straight away he has to work harder and work into a channel, it will also make it less likely to look around like a camel for things to spook at. Years ago I started thinking I was doing something wrong but and instructor had a go with him and found the same thing and taught me not to take it too personally and just laugh at him – sooner or later they will give up and get the idea. These days most of the time he’s given up being such an idiot. I have recently bought a miniature shetland mare. She is 33in and 16 years old. Do you think that she is too old to lunge? I have a lunge, a lunging whip and a lunging cavesson that fits her nicely, but I do not have a roller or side reins. She is quite a greedy mare and I would have to lunge her in a grass field. If you think I should lunge her, have you got any tips on how to get started? I don’t have much help! I’ve never had a shetland but I would still lunge a fit and healthy normal horse so I don’t see why not. Don’t worry about the roller or side reins if you haven’t got them. The trick to lunging her in the grass field is probably to be firm but fair with the lunge whip! Also, as she’s small you will want to lunge on a much smaller circle than usual. 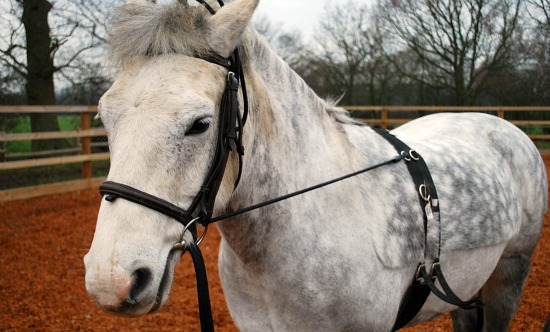 At 16 she’s probably been lunged before, but if she hasn’t you may want to teach her like you would a young horse – with another handler walking her in a circle on the end of the line for a bit while you stand in the middle – she’ll soon get the idea.